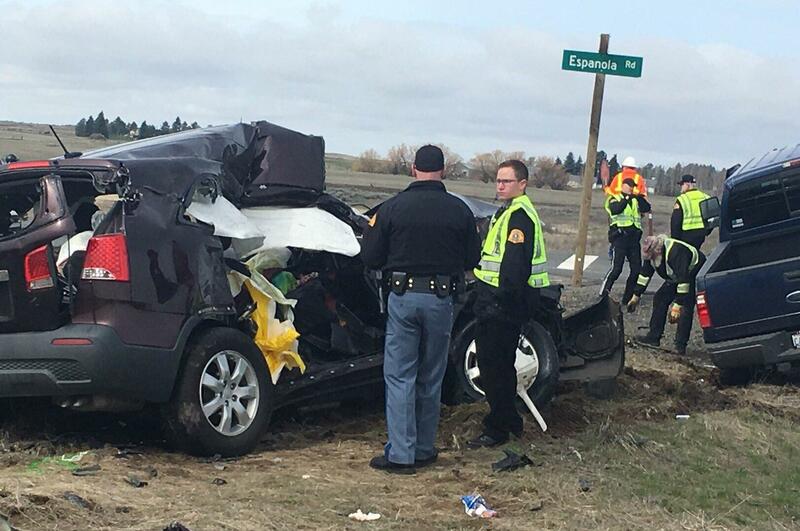 UPDATED: Sat., April 14, 2018, 10:10 p.m.
A member of the Medical Lake High School track team was killed and three others were injured in a two-vehicle collision west of Airway Heights on Saturday morning. An SUV carrying four female members of the track team was southbound on Wood Road around 6:45 a.m., according to the Washington State Patrol, when it was broadsided by a Ford F-250 driving eastbound on U.S. Highway 2. The SUV failed to yield, according to the WSP. Journey Tueller, 17, was killed, and three others – Lauren Gross, 17; Savannah Sutton, 14; and Laci Sica, 15 – were transported to a hospital with unknown injuries. The driver of the Ford, Lloyd Jones, 37, was treated at the scene and released. All four of the girls had been wearing seat belts, according to the WSP. Jones was not. According to firefighters, the girls in the SUV were en route to their team bus for a track meet. The Medical Lake track team opted not to compete in the track meet at Cheney High School. The team held a candlelight vigil at Medical Lake High’s track Saturday night. Published: April 14, 2018, 12:11 p.m. Updated: April 14, 2018, 10:10 p.m.